Some European cities have managed to reverse declining fertility rate trends. 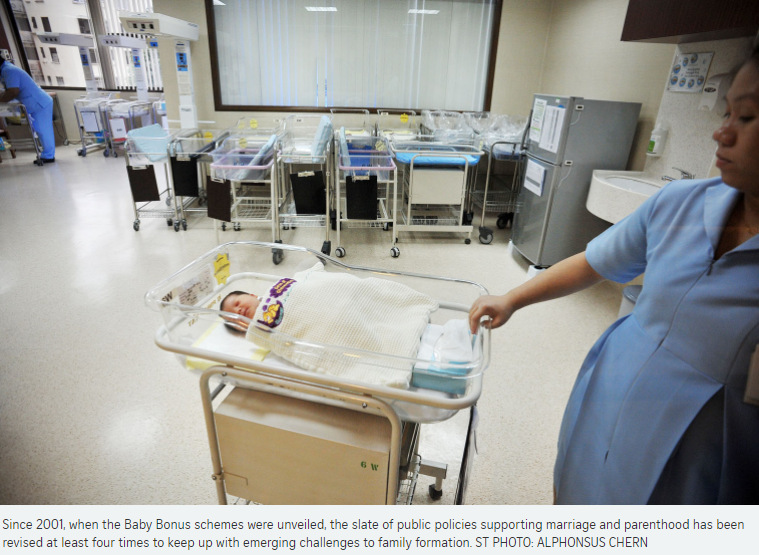 Singapore, too, must persevere in its society-wide efforts to become more pro-family. As a novice sociologist in 1991 returning to the National University of Singapore after completing my PhD, the very first project I embarked on was on work-life balance for women from dual-income families. As a young mother and a new assistant professor, I found it daunting to have to manage job expectations as well as be a good mother to my sons. My husband was facing similar challenges at his workplace, and we felt entrapped in a circumstance we seemed to have little control over. The power of sociological methodologies framed me with lenses that revealed the inter-connectedness of social agencies. Thus began my journey to distil the complexities of our population woes. Along the way, I matured as a sociologist and learnt more about the intricacies of the world we live in. My sociological model for understanding fertility decisions became more complex, and also more focused. Meanwhile, Singapore's marriage and birth rates continue to fall, making it more urgent to devise policies to ease transition to an ageing population. Some have argued that we should just face the inevitable, and focus on the advantages of growing a "quality" Singapore family, rather than think in terms of growing the quantity or size of the Singapore population. I find that disturbing on several grounds. Let me address these systematically. That we should accept that the Singapore population would shrink and do nothing about it, to me is nothing short of being irresponsible. This perspective may allay concerns of the present population as we struggle through spatial congestion and economic competition. But it does little to advance the needs of the younger and future generations. The correlation between population growth and economic health is notable. As a small city state that relies heavily on foreign investment to generate employment opportunities, Singapore's ageing labour force would not place us in good stead to compete with emerging markets in the region with younger and lower-cost labour forces. One argument suggests immigration as the solution to our population woes. Carefully calibrated immigration strategies do help in mitigating our ageing demographics, and a globalised workforce adds significant value to our cultural diversity. But relying primarily on immigration for population augmentation is not sustainable in the long run. First, to rely on surplus labour from the region puts our economic stability at high risk as we cannot control the supply of manpower inflow as and when the need arises. Second, the 2011 elections and conversations on the Population White Paper revealed how Singaporeans might be nervous about the inflow of immigrants. If we over-compensate through immigration to address the needs of the economy, we may aggravate social tensions and jeopardise racial harmony on home ground. For a multi-ethnic nation like Singapore, any attempts to segregate by national identities will inadvertently lead to dangerous discourse on race relations. Some scholars have argued that modernisation will inevitably result in smaller family sizes and it is futile to try to reverse the trend. But a cursory scan surfaces cities in developed countries that have managed to achieve impressive total fertility rate or TFR (which indicates the average number of children born per woman). Examples include Paris, Stockholm and London (with TFRs of 2.01, 1.77 and 1.72 respectively). This suggests that Singapore can aspire towards promoting a healthy TFR as we continue to modernise. To stand back and do nothing is to condemn Singaporeans to extinction. Unlike larger countries where fertility rates in rural hinterlands help compensate for smaller families in city centres, Singapore does not have this luxury. As a city state, norms tend to shift more rapidly as emergent trends are magnified. The decisions to get married and to enter parenthood remain private decisions. However, if there are barriers in place that make it difficult for those who want to get married and grow families to actualise their aspirations, then the onus is on us to look through policies and carefully curate public policies to eradicate those barriers. If the challenges to family formation are not addressed, then over time, singlehood or childless marriages will become the norm and the pleas of those parents who want to grow larger families will be even less compelling. Some argue that we should celebrate smaller families as they have more resources to spend on nurturing their children, and that with smaller birth cohorts, the state will have more resources directed at grooming a better educated albeit leaner workforce. I disagree with this for several reasons. First, I am not convinced that it is economically viable for a small city state like Singapore, which is dependent solely on human resource ,to take its eye off population growth. Our resident TFR has dipped slightly from 1.41 in 2001 to 1.20 last year. Singapore citizens numbered 3.4 million this year, and our labour force is augmented by about 1.6 million non-residents and 0.5 million permanent residents. The number of citizen births slipped from 36,402 in 2001 to 33,167 last year. Singaporeans continue to uphold marriage as a life goal, and the number of citizen marriages rose from 19,827 in 2001 to 23,873 last year. However, they are marrying later and the median age at first childbirth for citizen mothers has been rising, and was 30.3 last year. While I am not a big proponent of citing old age support data as many elderly people in fact do not need much support, nonetheless, I note with alarm that the resident old-age support ratio (residents aged 20 to 64 per resident aged 65 and older) fell from 8.8 in 2001 to 5.1 this year. As a mother, I certainly do not want to condemn my children to a scenario where future generations continue to dwindle. How will we staff basic needs like defence and health care? Or even just general services that facilitate everyday life? But perhaps the most important reason why we should continue to worry about population woes is that we want to promote a pro-family Singapore for those who want to grow families. From regular surveys, we know that marriage and family continue to be important life goals for Singaporeans. We also know that many remain single not out of wilful choice but because they find it difficult to meet like-minded individuals to share their aspirations with, and many attribute the lack of opportunities to expand their social circle as a barrier. Married couples cite financial burdens, childcare options, and managing work and family as their primary concerns. These barriers cannot be solved by individuals with their own resources. Without government support, and employer and community buy-in, issues on work-family life balance and infrastructural support will not be resolved. The barriers to marriage and parenthood must be addressed by larger society. Singapore has shown it is capable of crafting pro-family policies. Since 2001, when the Baby Bonus schemes were first announced, the slate of public policies supporting marriage and parenthood has been revised at least four times to stay abreast of emerging challenges to family formation. This demonstrates the Government's commitment to partner Singaporeans in their aspirations to grow family. And Singaporeans do appreciate these efforts; 70 per cent of respondents in the Institute of Policy Studies survey on Perceptions of the Marriage & Parenthood Package affirmed that such policies help make Singapore a conducive place for growing families. Perhaps more significant is the non-financial support in the Marriage & Parenthood Package. To address work-family life harmony, several leave schemes are now in place to facilitate involved parenthood for both mothers and fathers. Employers are encouraged with grant support to review and adopt flexiwork schemes that promote work-life balance. Over time, these measures strive to shift norms and align family formation as important work. While decisions on marriage and parenthood remain private choices, and many may choose to pursue other aspirations, I am grateful to have a government that continues to stand in strong partnership with those who choose to form families. The best thing that has happened to me in my life is meeting my husband, getting married and growing our family together. Our sons are now 25 and 22 years old, and parenthood remains the greatest joy for my husband and myself. I want younger Singaporeans to have the chance to experience the joys of family without having to succumb to hefty personal opportunity costs. The writer is Professor of Sociology (Practice), Dean of Students, Singapore Management University.